What number do you see? What number? 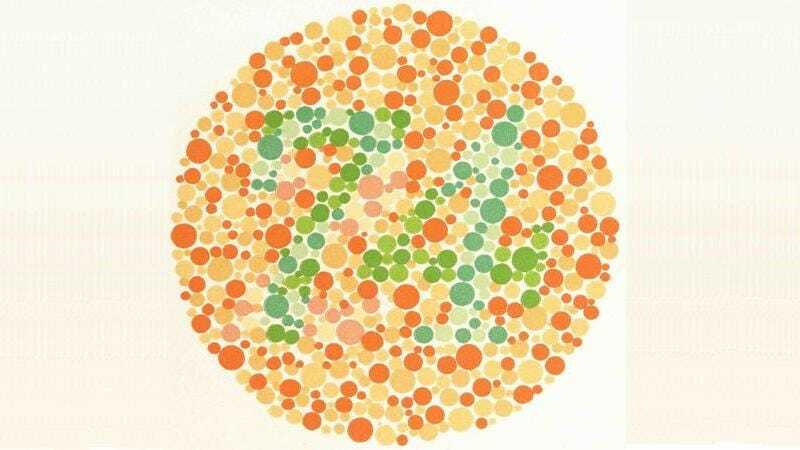 This is a plate from the Ishihara Color Perception Test. Right now, the number you read should let you know whether or not you have normal vision or are red-green color blind. If you look at the above plate and see a 74, you have normal vision. If you see a 21, you are red-green colorblind and I really need to talk to you. This test was invented by Dr Shinobu Ishihara all the way back in 1917, and it's still commonly used to diagnose color perception problems. The jumbled circles are chaotic enough to hide the lines of a numeral, and people are left with only the perception of a number they can see due to the color changes. Ishihara came up with shades and colors that screened for every possible kind of colorblindness, including fake colorblindness. 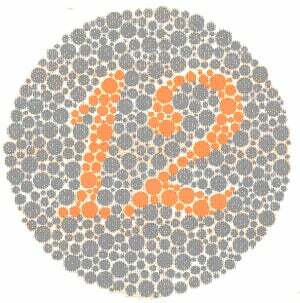 The number twelve we see on the plate above is visible to absolutely everyone except the completely blind. It was meant to screen out the liars. But there are other ways to screen for people who claim to be colorblind but aren't. The color perception test has a long series of different plates, and it's only after a number of different plates yield a consistent response that we can be sure that someone is colorblind. Some of the plates seem to have numbers that are obvious. Some are subtle. Some vary in color from character to character, and so a person with severe colorblindness will miss both characters and someone with moderate colorblindness will only miss some. There's one that I can just barely see. This last plate contains a 2 that is meant to be obvious to the red-green colorblind, and that I can pick out, but only if I concentrate. But I can't see that damn 21 at the top. What does it look like, colorblind io9ers? What does it look like?